INGREDIENTS: Fresh Mozzarella (Pasteurized Milk & Cream, Vinegar, Vegetable Enzymes, Salt), Canola Oil, Olive Oil, Sundried Tomatoes(sulfites to retain color), Fresh Parsley, Garlic. 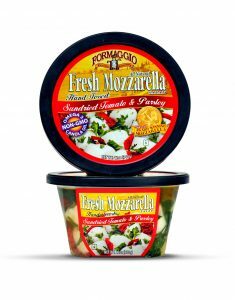 Formaggio Cheese is an awarding, customers' first choice Fresh Mozzarella manufacturer. We specialize in 'creative' mozzarella products. What do we mean by 'creative'? Well, all you have to do is look at one of our 75 different Fresh Mozzarella products and you will be able to see the Formaggio Difference! Time to jazz up your boring salad by adding the very first Three Dimensional salad dressing! Try Just Add Lettuce. We have 4 varieties...Italian, Spanish, Greek and Bleu cheese and cranberries. It is easy as 1,2, 3... just open the jar, pour and enjoy! Our mission is to make the freshest, most authentic Italian cheese experience, with the best flavor profile available.